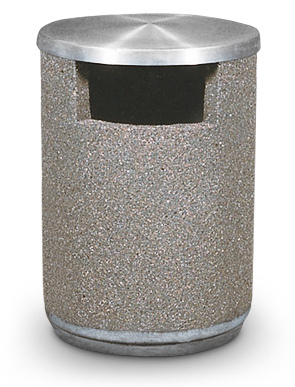 This large capacity, commercial grade concrete trash receptacle features a side opening, spun aluminum lid, and drain hole at the bottom. All three components work together to keep water out of the trash. Extremely durable with steel reinforced construction for maximum durability and minimum maintenance. Rigid plastic 36 gallon round liner measures 19-1/2" Dia. x 29-3/4"H and is sold separately. Treated with water-repellent sealer to enhance the appearance of the stones, help prevent water, salt or dirt penetration and cracking, and most importantly, extend the life of the aggregate by forming a protective barrier against the elements. 1" Drain Hole at Bottom. Spun aluminum lid is secured with vinyl coated cable, and can be powder-coated with any of the attractive complementary colors shown in the Lid Color Options. 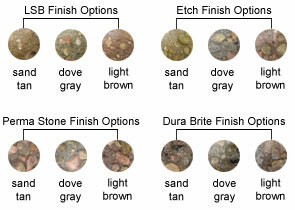 The concrete trash receptacle is available in Light Sand Blast, Etch, Perma Stone, and Dura Brite finish options. Manufactured from high quality aggregates to ensure all requirements are met according to ASTM standards.